Back in December when I was in Orange County, California, I enjoyed my early morning walks to and through Carbon Canyon Regional Park. As I have mentioned, the bird life there is relatively diverse and if you are lucky you can have an up close encounter with coyotes. 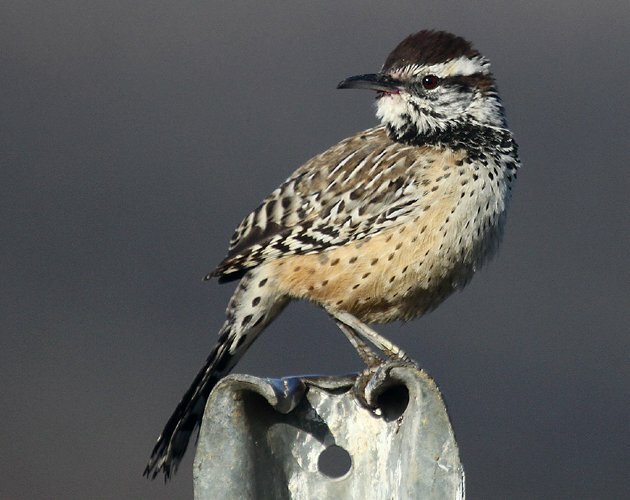 In previous winters the only wrens I came across at Carbon Canyon were Bewick’s Wrens but this past year I was pleased to discover that a Cactus Wren had taken up residence in the large patch of Prickly Pear Cactus at the south end of Carbon Canyon Regional Park. Like most Cactus Wrens it was not a shy bird and one morning it moved from perch to perch, singing often, along what I assume was the edge of its territory as I made my way past. The light was behind me and the bird was cooperative. What more could a birder with a camera ask for? 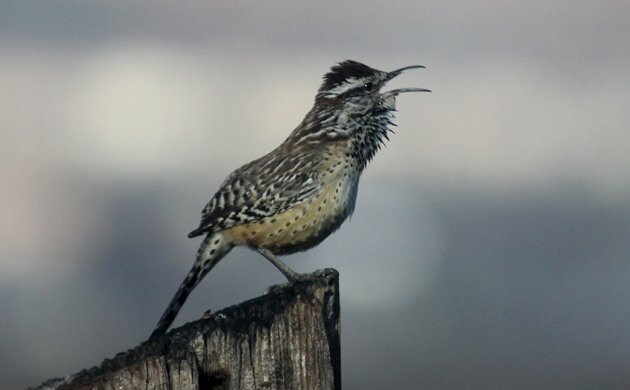 The Cactus Wren is a Species of Least Concern according to BirdLife International, with a large range across the southwestern United States and down through central and western Mexico and a large, though possibly slowly declining, population. In southern California, however, the species has suffered an estimated eighty percent decline since 1993, largely due to a couple of catastrophic wildfires. Slightly further south of where these pictures were taken, from southern Orange County south to Baja California, the subspecies called the San Diego Cactus Wren or Campylorhynchus brunneicapillus sandiegensis, is a California Species of Special Concern because of habitat fragmentation and destruction and a marked decline in the population. It seems likely that the bird depicted in this blog post is the subspecies C. b. anthonyi, which the literature I perused indicated is likely in the area, though I welcome any comments as to subspecific identification as I am a relative novice in terms of the birds of the west, especially when referring to subspecies. Regardless of what subspecies this particular bird is it was fun to photograph and watch it, especially when it eschewed man-made perches for its namesake plant. 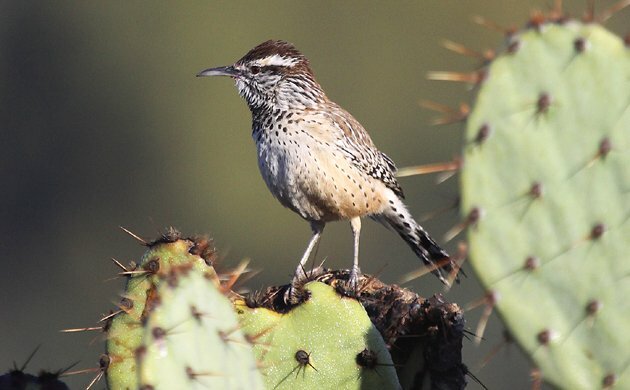 Cactus Wrens are dependent upon stands of Prickly Pear Cactus or Cholla Cactus, and they nest almost exclusively on them in southern California. As you can see though, they will use any convenient perch to broadcast their song and their claim on their territory. 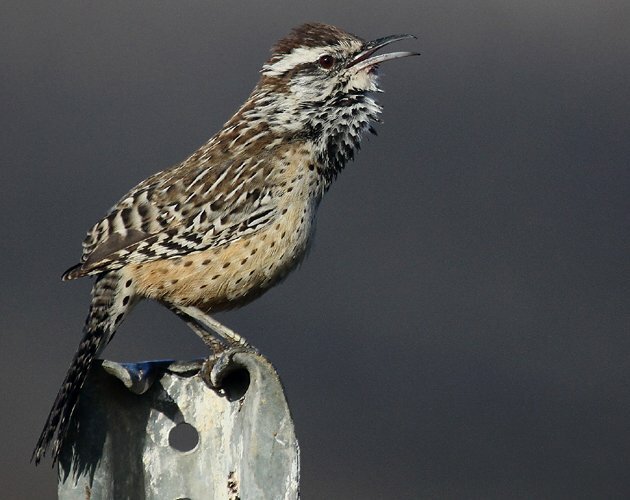 We go to Arizona every spring, and at the hotel we stay at in Sierra Vista, there are some very dark Cactus Wrens. In fact, I had trouble identifying them at first because they look as though they have been rolling around in soot. I enjoy stalking them in the morning before we head out for the day. Allison, they are a fun bird to follow, aren’t they?